BizReport : Research Library : 8x8 Inc. Some companies opt to deploy UC solutions on-premises, but the cloudbased model is gaining popularity. Cloud-based UC solutions are ideal for businesses that have limited IT staff, a distributed workforce and/or a desire for pay-as-you-go flexibility. 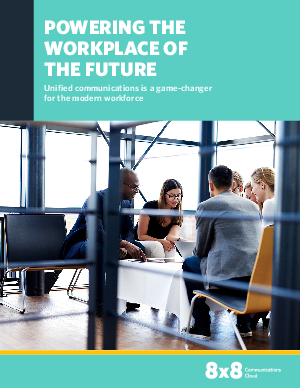 By enabling diverse communication media to be carried over a common IP network, UC solutions make it possible to manage a full suite of capabilities from a single point—and use them with common devices. But what’s the best way to maximize UC capabilities for your specific workplace? Spiceworks surveyed IT decision makers to get their insights on identifying and deploying collaboration and communication solutions across their organizations. This white paper explores the survey results, including key concerns, pain points, and roadmaps around driving UC strategies.